When I started this book, my initial impression was "this lady can write!" 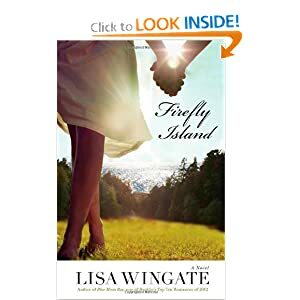 I loved the phraseology, the descriptions, the way Lisa Wingate used language. That's not normal for me. Most of the time I see the language as a medium, not noticeable unless it is extraordinarily good or bad. Most romance novels end with a wedding; this love story includes the wedding but takes place mostly after the wedding, and it deals with the problems newlyweds face, particularly newlyweds who have to give up their old life to embrace the new. Mallory ends up as a blogger, "Frontier Woman" who writes about her life in this small remote town. As a blogger I had to smile when she'd check her stats and get excited to learn that someone was reading what she was writing. The book sort of slowly meanders through Mallory adapting to this new life, and then it seems, almost suddenly, it ramps into high gear with a mysterious accident and some investigation that only someone with Mallory's specific set of contacts and knowledge would be able to do before wrapping up neatly. Without giving anything away, it was just too tidy. The term "Christian fiction" covers the waterfront, but in this case it means a mention of churchgoing (but no sermons) and a Bible quote coming to Mallory in a dream. Unless any mention of religion bothers you, the religion in this book shouldn't be a problem for you. I'd like to thank Bethany House Publishers for providing a complimentary review copy. Grade: B.
I looooved this book, and it will prob be a fave for the year for me. I just loved everything about it. It was like - the perfect book for me, ya know? I have read a few of Lisa's books before but I think this one is the best so far. Well, obviously I liked the book, but evidently not quite as much as you did. I will try others by Lisa.